Friday June 6 Woke up at 6:00 am. Loaded the canoe onto my Ford Escape. I was soon on my way to Killarney Provincial Park. I arrived at 8:00 am as they were just opening the office. My cousin Tim Bennison pulled into the parking lot shortly after. Tim and I had not seen each other for many years. Obtaining our camping permits, we were soon paddling on George Lake. It was a beautiful sunny day with the lake waters being calm. After a leisure paddle we arrived at our first portage into Freeland 188 Lake. This is a 80 m portage. Easing out into Freeland 188 Lake Tim spotted a yearling Black Bear ambling along the shoreline. We soon approached the portage into Killarney Lake. Unloading our gear we hauled our equipment over the 380 m portage. The creek between Killarney Lake and Freeman 188 Lake was running quite high. Here we encountered our first taste of Northern Ontario, bugs. They were out in force. Tim and I did not waste much time here and were soon on our way. It does not matter how many times I have paddled here, that I am in awe of the scene before me when you arrive onto the open water of Killarney Lake. It is very awe inspiring to see the turquoise blue waters nestled among the white quartz of the La Cloche Mountains rising on either side of Killarney Lake. This was Tim’s first trip to Killarney Provincial Park. We paddled East down the length of Killarney Lake on calm waters. Paddling slowly and indulging in the vista before us. Upon reaching the Norway Lake portage, the canoe was unloaded. Being lunchtime we ate sandwiches. It was a good size clearing here that looked like there may have been a building here at one time. Tim discovered a small patch of rhubarb growing in the clearing. Well it was time to move gear over this 1390 m portage. Neither one of us had undertaking this portage. It was getting warmer and the bugs were waiting. The portage had a series of mud holes at the beginning to slog through. The portage then became dryer as we pushed on. The forest was fairly open here with Maple, Hemlock and some Yellow Birch. After battling flies and uneven ground we made it to Norway Lake. It took us two trips to get everything over the portage. It seems that we always have too much equipment. Tim and I were both now tired and sore. The first island had a campsite, so that is where we headed for. With the tent up and everything layed out, it was time for a nap. Norway Lake is very nice, but in terms of photographing not very good. The canoe was launched after supper to explore the lake. Concluding our trip around the lake I was of the opinion that we had our work cut out to obtain any good photographic works. With the sun gone down and darkness descending we were soon nestled in our sleeping bags for the night. That is it for now. So until next time happy trails. I ventured into the Northwest corner of George Lake last Friday evening and Saturday evening to photograph the quartz rock ridge that is located in a small bay. This quartz rock formation has great detail to work with. Friday I canoed here with a friend and then Saturday I hiked in. I must say the bugs are bad at this time of year. They can cause a few problems with photographing by leaving streak marks on your photo or just a nice blurry blob. There are just enough trees and shrubs on the side of the rock face to add depth and contrast. I framed the rock with a portion of the forest at the top. I tied this rock structure in with a portion of the La Cloche Mountains . There was a lone cloud in the upper right corner surrounded by blue sky. There was also some mist like cloud cover that can be seen. While that is it for this week. 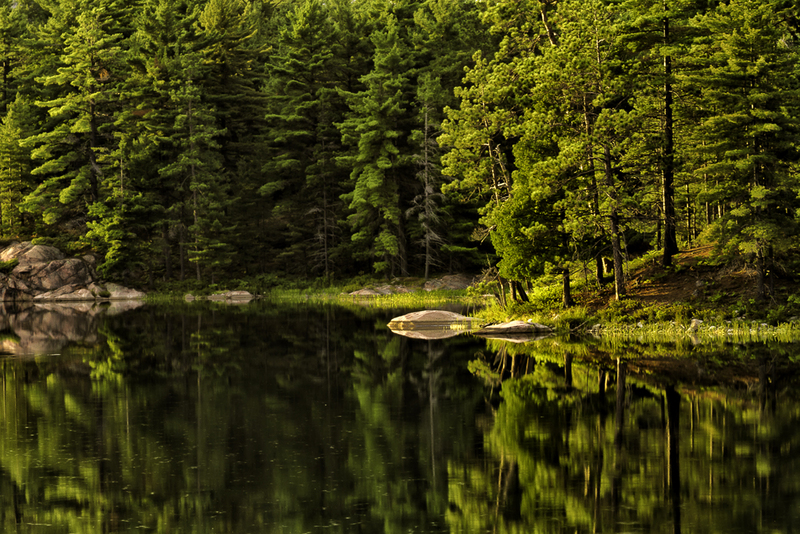 I am off for a four day canoe trip tomorrow into Norway Lake in Killarney Provincial Park. So until next week week happy trails. Wednesday morning I crawled out of bed at 4:45 A M. Loaded my cooler with food and water for the day. Grabbed my camera bag and tripod. 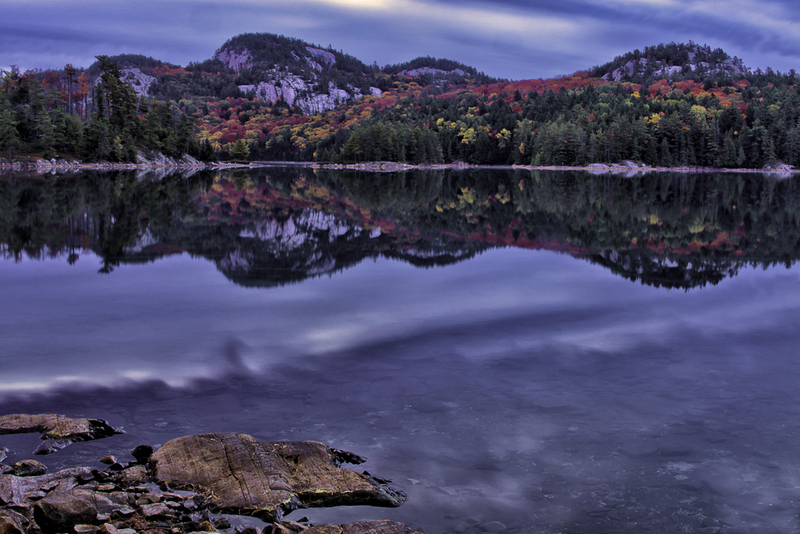 My goal was to arrive at Killarney Provincial Park at daybreak. I stopped at Tim Horton’s for my coffee and was soon on my way. I arrived at the park a little after daybreak . The first thing I noticed was that a slight breeze was dancing here and there on the lake surface. Hmm not so good. I unloaded my camera gear and set up my equipment behind Turner Point on George Lake. This is a very unique rock point with its own character. Many times what I have seen with this type of conditions is to just create your composition in your viewfinder and wait. It was not too long before the water became smooth again. I was then able to get my shot. One of the problems I had here was that Turner Point was getting a lot of sun. The rock could easily have blown highlights. On the other end of the scale the right side of the photo was in shadow as was part of the mountain side. On the plus side you can see the sunlight highlighting some of the trees on the mountains. By 8:00 A M the photographing was finished. I packed up and headed for the Chikanishing River. I left the Escape at the parking lot. I picked up the hiking trail that would take me down to the mouth of the Chikanishing River. This river empties into Georgian Bay on Lake Huron. There are beautiful time worn rock structures along the shore line plus some islands dotted here and there. By now it was getting hot. I found a nice spot to rest out of the sun under an evergreen tree with a flat rock to rest my back. I had brought my e reader with me to pass the time. As I was reading I sensed something in front of me. It was a fairly large Garter Snake eyeing me. It stayed there for short time before moving off to my left and going under a rock. Evening soon came, but no respite from the light breeze. I finally gave up around 8:00 P M. I wanted to be back at my Escape before dark. I was soon on my way home. While traveling on the Killarney highway I came upon a Moose cow with her twin calves from last year. They are quite scruffy at this time of year. Well that is it for this week. It was great to finally get out in the outdoors and do some shooting. I will be at the Rubber Boot Festival in Noelville tomorrow. Monday morning dawned.I had loaded my Ford Explorer the previous night.The Quetico 17 Kevler canoe was loaded the night before also.I am a big fan of the Quetico 17 made by Souris River.For more info check here. After a quick stop to pick up my partner Paul Smith for this trip we were soon on the road to Killarney Provincial Park.This is about an hour and a half trip for us.A stop at the main office to obtain our permits ,we were soon loading the canoe and heading out into George Lake. The winds were light,the sun was warm and the Fall colors were beautiful.The water levels on George Lake were good considering the dry summer we had.The paddling through Freeland was uneventful and we were soon over the Killarney Lake Portage into Killarney Lake itself.While at the portage I talked to four gentleman who were making there first trip into the interior.There destination was OSA Lake. As we paddled the West end of Killarney Lake it was noted that there were a few campsites taken.The water levels were low on Killarney Lake. Arriving at the shorelines of OSA Lake is always breathtaking.The pebble beach at your feet,The La Cloche Mountains with white quartz rocks on either side of you,the turquoise blue water stretching before you,the distant islands in the distance.The mountains were adorned with there Fall color. That is why this lake is a popular destination for many canoeist. Two couples were portaging out and they told us the big island was available.Paul and I made our way to the large island.We unloaded our gear and set up our chairs for a little rest before setting up the campsite. Monday evening the winds started to calm down.Paul and I stayed on the island that evening to do our photographing.This is a good campsite to work from, for the variety of angles one can work with.Some areas of the lake the wind was calm while in other parts a ripple effect was left.I was able to capture the above scene by combining the La Cloche Mountains with a bit of the near shoreline.I set my Canon D7 on the tripod and shot two vertical images overlapping.This allowed for the inclusion of the near shoreline.The sky was quite interesting as well as the sky reflecting in the water.You will also get a glimpse of the lake bottom in the foreground.The colors on the mountain side was great.There is a bit of a pink hue on rounded mountain peaks. The evening was cooling down now.It was a good idea to put on long johns before we went to bed that night.Paul got the fire going as the days are short with darkness coming early.It was nice to sit by the warm glow of the fire.The moon came up as we sat,casting its silvery light over the lake surface.We were soon off to bed.It was nice and warm in my sleeping bag thinking as to what dawn would bring us. I will continue at a later date on this trip.It was to prove to be a different five days than the five day trip last year at this time due to the weather.Until next time happy trails. 4:00 am comes early.I had about an hour and a half drive to Killarney Provincial Park to catch the dawn shooting.Stopping at Tim Hortons for a take out coffee I was soon on Hwy 69 heading South. The drive was uneventful and I was soon parked at the main campsite on George Lake.The wind was blowing over the lake which meant no photographing that morning.I now had to wait till evening and hope that the wind would calm down. As I was standing there my eye was drawn to a point on my right.The trees were glowing on this small point of land.The sun near the horizon was going in and out of the clouds.Being hot and humid there was some interesting lighting being created on the scene that I composed as shown above.Darkness was soon approaching as I made my way back down to my Ford Escape.Happy and tired I was on my way home.Another great day at the park. Well that is it for this week.Thank you for stopping by and until next time happy trails.